The main goals of PRISMA are to perform GNC (Guidance, Navigation and Control) demonstrations and sensor technology experiments for a family of future missions where rendezvous and formation flying are a necessary prerequisite. • The GNC demonstrations are: 1) Autonomous formation flying, 2) homing and rendezvous, 3) proximity operations or RV (Rendezvous) tests, including final approach and recede operations. • The sensor technology tests are: GPS-based navigation (evaluation of real-time differential GPS used for autonomous formation flying), RF metrology, and a star tracker-based vision sensor to evaluate multi-range tracking. Mission concept: The mission consists of two spacecraft, one advanced and highly maneuverable one, called MAIN, and a smaller S/C without a maneuvering capability, called TARGET. The latter one simply follows the trajectory into which it is injected by the launch system. The MAIN spacecraft has full translational capability, and will perform a series of maneuvers around the TARGET, on both close and long range approach, using the different sensors provided. Both S/C will be delivered into the same orbit. In most cases, the MAIN will fly along-track with respect to the TARGET, such that the MAIN can "look" at the TARGET. The MAIN is a fully 3-axis stabilized spacecraft with 6 thrusters arranged to provide a torque-free translational capability in all directions. The MAIN performs all autonomous maneuvers and maintains communication to the ground. In contrast, the TARGET has a coarse 3-axis stabilization system by means of magnetic control only (magnetorquer) and GPS receivers, but without any ?V capability. It acts like a visible target for the MAIN, and communicates its position and status to the MAIN via a 450 MHz (UHF) intersatellite link (ISL). There are actually two ISLs between MAIN and TARGET, the primary ISL used for telecommands and telemetry (TMTC), and the ISL integrated into the RF-metrology sensor. The latter one is called the FFRF (Formation Flying Radio Frequency) unit which communicates with the corresponding unit on MAIN. Both MAIN and TARGET are equipped with GPS receivers. Relative position is either determined using GPS receivers, or with the VBS (Vision Based Sensor), depending upon the experiment. TARGET relies on one body-mounted solar panel providing about 90 W max. The structure of MAIN has a box shape of approximate size: 80 cm x 83 cm x 130 cm. There are 2 deployable solar panels (GaAs solar cells) of 2 m2 in total area. Power of about 300 W is provided. A Li-ion battery (3 packs of about 300 Wh in total) is used for eclipse operations. The ADCS uses four reaction wheels and six thrusters for actuation (1 N thrusters arranged to give torque-free translational capability in all directions), the angular momentum is managed through a magnetic torque-rod system. Attitude sensing is provided by two 3-axis magnetometers, a star tracker system with two camera heads (µASC) for inertial pointing, sun sensors, VBS, and two GPS receivers. The power subsystem has a regulated power controller. The DHS (Data Handling Subsystem) on MAIN employs a spacecraft controller based on a LEON3-FT (Fault Tolerant) microprocessor (as OBC) from Aeroflex Gaisler. LEON3-FT implements a 32-bit processor compliant with the SPARC V8 architecture which is particularly suited for embedded applications. LEON3-FT recognizes bit flips and is fault tolerant. 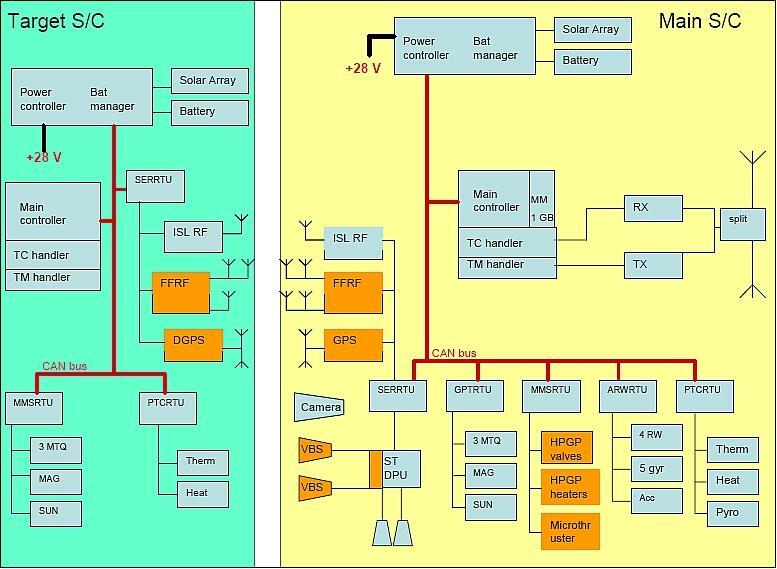 Its implementation through a Field Programmable Gate Array (FPGA) of Actel Corporation (Mountain View, CA, USA) provides a performance of about 20 MIPS and accommodates one FPU (Floating Point Unit). 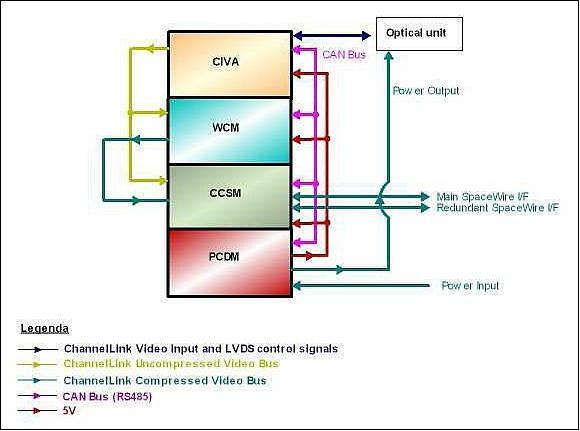 The OBC communicates on a CAN (Controller Area Network) bus with the power subsystem and the 5 RTUs (Remote Terminal Units) on the MAIN, and 3 RTUs on the TARGET. Orbit control is achieved with the HPGP (High Performance Green Propulsion) thruster system (see "Sensor and actuator experiments" below). The S/C masses are approximately 145 (wet mass) for the MAIN and 50 kg for the TARGET. The TARGET dimensions are: 80 cm x 80 cm x 31 cm. They are launched clamped together (referred to as "Combine") such that the first mission phase will be a joint operation of the 2 satellites where critical systems can be checked out. 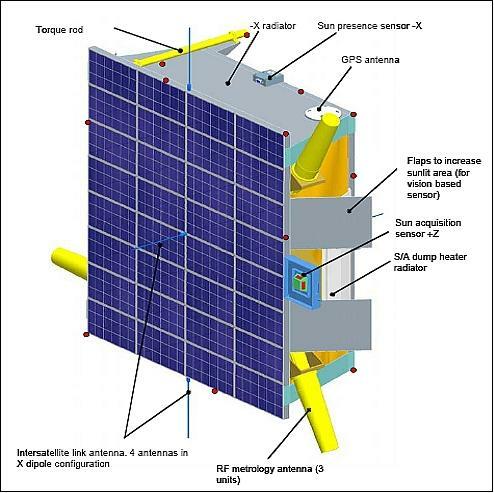 The TARGET spacecraft is a small box with one surface-mounted solar panel (Figure 4) and with a panel area of about 0.5 m2 (GaAs solar cells); power of about 90 W is provided. Its nominal orientation is sun or zenith pointing. TARGET has coarse 3-axis stabilization by means of magnetic control only, but possesses no ?V capability. • A robust safe mode shall be implemented to stabilize the spacecraft towards the sun in typically less than half an orbit after separation from MAIN (1 orbit in the case of a recovery after a failure), from any initial attitude and from angular rates of up to 2o/s. • During normal operations, the GPS antenna shall point towards zenith ±20o to optimize conditions for relative GPS navigation (this requirement is relaxed when TARGET is "non cooperative"). • TARGET shall also be able to mimic a non-cooperative spacecraft, tumbling with a low angular rate around one axis. This feature excludes the use of a gravity gradient boom on the spacecraft. The TARGET spacecraft is a box of size 80 cm x 75 cm x 32 cm. The solar array covers the +z side. The attitude control uses magnetic torque rods only (maximum magnetic moment allowed: 2.5 Am2). The attitude estimation is based on magnetometer and sun sensor measurements. The sun sensors consist of six sun presence cells (one on each side) and a fine sensor in the +z direction (fine field of view ±25o). Sensors, actuators as well as associated electronics are cold redundant. Note: the GPS is not used by the Attitude Control System on board TARGET. Rather, TARGET communicates its position to the MAIN via an ISL (Inter Satellite Link), and the relative position and velocity is calculated in real-time with centimeter accuracy. The launch had been delayed for months because of a dispute between Russia and Kazakhstan over the issue of rocket debris falling on Kazakh territory. Orbit: Sun-synchronous near-circular dawn-dusk orbit, altitude of about 720 km x 780 km, inclination of 98.2o, LTAN (Local Time of Ascending Node) of 6:00 hours (or 18:00 hours). RF communications: The MAIN communicates in S-band at a downlink rate of up to 1 Mbit/s and an uplink of 4 kbit/s. The communication protocol uses the CCSDS standard. - The TARGET does not have a dedicated ground link but communicates instead with the MAIN via an intersatellite link (ISL) in the 450 MHz band (UHF). The communication speed is 19.6 kbit/s in both directions. The mission lifetime is planned for at least eight months to cover all demonstrations. The PRISMA ground station is Esrange (Kiruna) in northern Sweden. The mission will be operated from SSC at Solna, Sweden. 1) AFF (Autonomous Formation Flying): The AFF experiment concerns semi-passive relative periodic orbits that do not attempt to counteract the Earth's gravitational force. SSC and DLR will conduct separate experiments using separate guidance and control strategies. Both experiments are using the Differential GPS and navigation filters supplied by DLR. The experiment set aims at demonstrating initialization, reconfiguration, and autonomous control of time-periodic motions. The objective is to show that the MAIN spacecraft can autonomously establish and maintain a fix time-periodic relative distance to the TARGET on typically decimeter-level of control, counteracting gravitational, drag and other disturbance forces with a minimum of fuel consumption and with no ground intervention. The relative distances are in the range of 30 cm to several hundred meters. The requirements call for a test validation in eccentric orbits as well as circular orbits. The Phoenix GPS receivers offers single-frequency Coarse/Acquisition (C/A) code and carrier tracking and can be aided with a priori trajectory information to safely acquire GPS signals even at high altitudes and velocities. Upon tracking, Phoenix outputs a 1 PPS signal and aligns the message time tags to integer GPS seconds which facilitates differential processing. Phoenix provides a code tracking accuracy of better than 0.5 m and a carrier-phase accuracy of better than 1 mm at 45 dB-Hz. With a mass of the receiver board of 70 gram and a power consumption of 0.85 W at BOL, the receiver is particularly suited for small satellite missions. 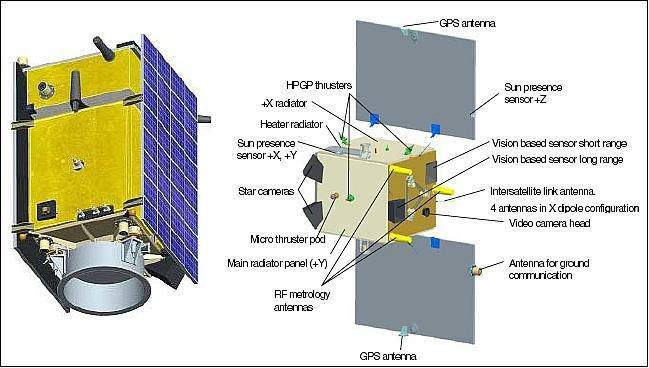 The architecture of the GPS hardware system is depicted in Figure 10. For redundancy purposes, each satellite will carry two independent GPS receivers. 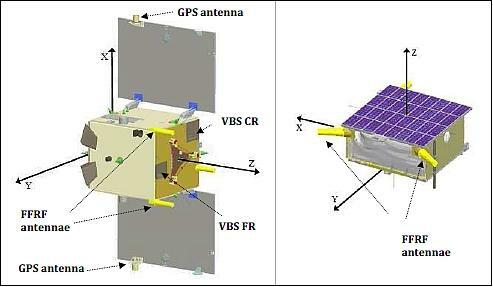 Increased flexibility for handling non-zenith pointing attitudes and to maximize the field of view (FOV) to the GPS constellation is provided by two independent GPS antennas. Using a radiofrequency relay, the active GPS receiver and the associated low noise amplifier (LNA) can be connected to the optimal antenna through ground command or an automated onboard process. • SAFE (Spaceborne Autonomous Formation Flying Experiment) provided by DLR. SAFE complements other PRISMA experiment sets with the objective to demonstrate a fully autonomous, robust and precise formation flying of spacecraft. To this end, a fuel-optimized formation flying at typical distances of 100 to 2000 m is foreseen, which is representative of future bi-static radar satellite formation flying missions. SAFE aims at a position control accuracy of 10/20/10 m (R/T/N, 1?). Note: R/T/N are orbit frame components in radial (R), tangential (T), and normal (N) directions. Maneuver executions are conveniently based upon requests for velocity increments issued by SAFE. Since the velocity increments are provided in an orbital frame, SAFE requires no attitude knowledge and complex propulsion system operations such as thruster pre-heating and thrust profile modeling which are being avoided. Including the formation acquisition phases, a velocity increment budget of 5 m/s is allocated for SAFE. A total of six weeks will be allocated exclusively for SAFE operations, including one week of initial calibration and two weeks of open-loop operations. While initial calibration refers to the verification of GPS-based absolute and relative navigation, open-loop operations denote formation control phases which are not entirely performed autonomously. The overall GNC architecture is shown in Figure 11. Upon tracking, the GPS receivers provide a one Pulse-per-Second (1PPS) for onboard time synchronization and deliver data messages containing raw GPS code and carrier phases to the GPS navigation function. The navigation function performs a reduced-dynamic filtering of GPS raw data and provides absolute MAIN and relative TARGET with respect MAIN orbit information. Orbit information is, furthermore, provided to the autonomous formation control (AFC) and autonomous orbit keeping (AOK) applications for computing the requested velocity increments. The GPS-based navigation system onboard MAIN will process the local raw GPS measurements as well as the code and carrier phase measurements transmitted from TARGET by an inter-satellite radio link. Spacecraft attitude information is applied to correct for the GPS antenna offset with respect to the spacecraft center of mass and orbit maneuver data is accounted for in the orbit prediction. The navigation system will provide absolute position and velocity data of MAIN and relative position and velocity data of TARGET with respect to MAIN at a 1 Hz data rate for GNC functions and PRISMA payload. 2) Homing and rendezvous experiment. This test series involves long-range tracking and rendezvous operations by optical means. A VBS (Vision-based Sensor) is used to identify the TARGET as a non-stellar object at distances up to 500 km (TARGET will be quipped with switchable light diodes), and to track the TARGET down to very close range, typically 10 m during a sequence of autonomously scheduled approach maneuvers. For each experiment, MAIN is placed in a specific initial relative orbit with respect to TARGET by ground commands before enabling autonomy. The plane and phase of the initial relative orbit is already aligned with the TARGET's reference orbit. Then MAIN will autonomously locate TARGET and autonomously rendezvous within a predetermined approach corridor. MAIN will perform onboard orbit determination without GPS data, thereby mimicking a rendezvous mission beyond the reach of the GPS sphere. 3) Proximity operations. The test series includes final approach/recede maneuvers where the MAIN will navigate as close as possible to the TARGET. The guidance algorithms on the MAIN S/C will autonomously generate trajectories to traverse between various holding points in the TARGET body frame. The model mission technology demonstrations are: a) on-orbit servicing, b) on-orbit inspection, and c) on-orbit assembly, in both near-earth scenarios and beyond. The PRISMA POD facility is based on the GHOST (GPS High precision Orbit determination Software Tools) software package of DLR. This software suite is already used routinely to support many missions (GRACE, CHAMP, TerraSAR-X, TanDEM-X, PROBA-2) and has already proved its high-readiness level as well as its ability to provide reliable and accurate orbit products. The data processing for precise orbit determination follows the scheme depicted on Figure 12. The onboard primary navigation system relies on GPS measurements to provide in real-time accurate absolute and relative navigation. The output of the PS-based navigation system is used to feed the numerous on-board feedback controllers and the safety monitoring and collision avoidance functions. As a consequence the navigation system has to provide the utmost accuracy to the experimental payloads and, at the same time, be robust and reliable to support fault detection isolation and recovery tasks. The commissioning of the GPS navigation system is therefore a crucial milestone for the mission. It has to be ensured that the onboard navigation solution is always reliable even in the presence of hardware anomalies and that the navigation performance satisfies the mission requirements. The successful commissioning of the GPS navigation system in the fall of 2010 of the PRISMA mission demonstrates that GPS-based navigation is well suited for autonomous formation flying in low Earth orbit. In particular, thanks to its high technology readiness level, the GPS navigation system can be used for autonomous monitoring of the formation safety and may serve as real-time relative positioning sensor for close proximity (up to several meters) operations. The COTS Phoenix receivers, used in the mission, are shown to provide excellent tracking capabilities and high measurement quality, which make them well suited to GPS-based absolute and relative navigation. The flight experience, gained during the first half year of the mission, shows that the radiation events on the Phoenix receivers are not destructive; their effects can be mitigated by implementing a proper onboard strategy for rapid fault detection and recovery and by complementing the GPS receivers with an onboard filter able to bridge any short data gaps. The on-ground post-facto generation of precise orbit products, essential for the cross-validation of other experimental relative positioning sensors, has been successfully commissioned. Ultimate relative positioning accuracy is achieved using the resolution of integer double difference carrier phase ambiguities. The performance analyses done during the commissioning have shown that the resulting relative positioning is accurate at the (sub)-centimeter level. About 75% of the orbit products have been generated in 2010 using this method, which is still very sensitive to any perturbations. As a consequence, another more robust but less accurate method, based on the estimation of float ambiguities, is used to generate relative positioning products with an accuracy better than 10 cm when the integer ambiguity fixing fails. The resulting accuracy is still sufficient to monitor routinely the health of the onboard navigation. Accurate absolute and relative navigation is provided in real time by the onboard filter, which processes directly the GPS raw measurements from the receivers. The navigation performance has been verified using the precise orbit products generated on-ground. Under nominal conditions, absolute navigation at the meter level and relative navigation at the sub-decimeter level can be expected. The filter is shown to be robust in all challenging conditions encountered during the mission, but is per design very sensitive to long data gaps. Robust but poor filter settings have been derived during the commissioning to cope with the mission phases affected by numerous data gaps. Minor software anomalies have been observed, which have either been fixed via a software patch or are currently under investigation. With respect to real-time applications, the sub-decimeter relative navigation accuracy demonstrated on PRISMA does not yet exploit the full potential of CDGPS positioning but reflects a compromise between technical complexity, mission requirements and the need for robust operation in widely different scenarios. 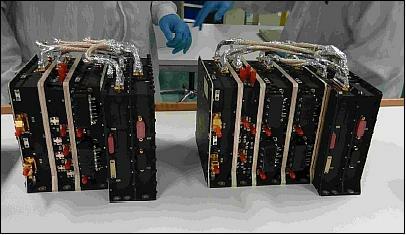 - The critical phase of the IRIDES experiment is the close range inspection of the non-cooperative satellite Picard and this phase is planned to start in the end of August 2014. It has the goal of capturing high resolution images of Picard from a close but safe distance while performing collision free fly-by trajectories and keeping the cameras correctly pointing. The nature of these relative trajectories is such that all possible illumination conditions will occur, including pointing the cameras towards the sun as well as pointing them into deep dark space. The camera for image capturing will not be the relative VBS sensor, but instead the high resolution color capturing DVS (Digital Video System) camera. 1) Estimate the Picard absolute orbit parameters with the VBS system from the current safe relative position. To do this, a known delta-V maneuver needs to be applied in the cross-track/radial plane to create observability of the relative distance to Picard. This delta-V maneuver is planned such as it will reduce the relative cross-track and radial components. A first glimpse of Picard is shown in the left of Figure 13, which was captured on March 18, 2014. 2) With the Picard orbit and hence the relative distance determined to a certain accuracy, a small long-track drift will be initiated to create a slow collision free helix shaped trajectory, circling the Picard satellite. 3) During this trajectory, the cameras on Mango will be pointing towards Picard based on either an attitude profile or using the autonomous target pointing mode on-board Mango. Due to the forced attitude, the solar panels will no longer be sun pointing and as much payload as possible needs to be powered off to be able to capture a long series of images with the DVS camera. 4) When safely at the other side of Picard, the relative drift will be stopped and the procedure will be repeated in the opposite direction until the accuracy of the estimated Picard orbit parameters is comparable with the stepwise constant cross-track/radial minimum distance. The entire close range inspection procedure is illustrated in Figure 13, showing the helix trajectory closing in on Picard. The close range inspection needs to be finalized before the end of September. - Capture and/or physical interaction: Should Mango have been equipped with a grappling device the close range inspection would have been extended to also include a capturing phase. In this phase the goal would have been to connect Mango and Picard mechanically to each other, and to detumble and control the resulting duo. However, no such device is installed on-board Mango and this step will not be performed within the IRIDES experiment. - Deorbit: With the successful close range inspection finished it only remains to empty the propellant tanks in a way to minimize the remaining time Mango has left in orbit. To this end, it is deemed as a good decision to lower the semi major axis as much as possible; this in order to be complying with the intentions of current international space debris mitigation policies. The goal is to lower the perigee of Mango as much as possible. The methodology for the deorbit will be similar to the drift start campaign, using the GPS receiver on Mango for orbit estimation and then apply manual delta-V maneuvers at apogee to lower the perigee as much as possible. Included in this maneuvering is to analyze the effect of each burn in advance by comparing the estimated post-burn TLE's with the current set of online TLE's provided by JSpOC in order to avoid unnecessary conjunctions. Decisions can then be taken to delay the maneuver sequence if necessary. This method will be gradually utilized for the far range rendezvous and the close range inspection as well. - Object characterization: As a result of the close range experiment several image sequences of Picard will be available, captured with the DIVS. These images will be processed on-ground to estimate the relative pose and range of Picard, including its tumbling rate and spin axis. The goal is to develop object characterization algorithms that can produce estimates of the parameters needed for a capturing maneuver. This will have a challenging aspect due to the extreme variation of the illumination conditions formed by the relative helix trajectory. It is also important the image rate is adjusted appropriately to the timeframe of the relative motion to not have too sparse images. Different methods are considered depending on the rate of the images. The object characterization phase is not considered part of the flight experiment since it is entirely ground based and is instead seen as a follow-on activity (Ref. 38). The mission phase started with the decommissioning of Tango by permanently shutting down all systems on-board the spacecraft. This was a necessary step since Tango does not have any direct ground communication capability and only is possible to command via the intersatellite link from Mango. The transfer start orbit was then executed in a series of delta-V maneuvers from May 13 to June 20, 2013. The total amount of delta-V was 32 m/s. Initially, the transfer start was planned to be performed by lowering the perigee only. This could be achieved by selecting the time for the maneuver when the perigee occurs on the equators. The advantage of this approach was that the lowering of the perigee introduces some additional drag which then is possible to utilize as additional delta-V. Unfortunately, the thruster pulse firing period took longer time than expected. The main reasons were to allow for proper performance evaluation of the propulsion systems as well as the assessment of feasibility to increase the duration of each thrust pulse. As a result, there was a period in the middle of the transfer start during which no thruster pulses were fired. IRIDES phase: Only in the initial approach phase, the absolute GPS is the primary source for navigation. After this point, the VBS (Vision Based Sensor) will be the primary instrument for relative navigation while the absolute navigation based on the GPS is used for monitoring only. The VBS is used in a relative navigation filter using optical line of sight measurement delivered from the sensor. The navigation is performed on-board using the navigation software that was validated within the PRISMA Autonomous Rendezvous experiment. The navigation performance at a distance of 50 m is expected to be better than 10 m along-track and 1 m in cross-track and radial direction. 1) With a sequence of delta-V maneuvers, Mango's orbit is lowered such that the spacecraft approaches the rendezvous object. 2) After a long drift phase, a second sequence of delta-V maneuvers is performed to raise Mango's orbit such that its semi-major axis is the same as for the rendezvous object. This sequence of delta-V maneuvers is computed such that a separation in eccentricity and inclination is established. This will guarantee that the orbits of Mango and the rendezvous object do not cross regardless of any remaining relative drift along-track. The relative distance in this step is approximately 30 km. 3) A drift is initiated along-track to approach the rendezvous object. 1) Mango drifts to the other side of the rendezvous object still with a constant separation in the cross-track and radial plane. 2) The drift is stopped at a safe distance away from the object on the other side. 3) A delta-V is executed in order to reduce the distance in the cross-track and radial plane. 4) Establishment of the new cross-track and radial separation is verified. 5) A drift is again initialized to pass the rendezvous object again but now in the other direction. The steps 2 through 5 are then repeated until it is decided that the distance between Mango and the rendezvous object can no longer be reduced while at the same time guaranteeing safety. During the fly-by maneuvers of the rendezvous object, Mango will be target-pointing based on the measurements from the VBS allowing for sensor and digital video system image capturing of the rendezvous object. All control will be based on time-tagged delta-V maneuvers computed on-ground and uploaded to Mango. All on-board navigation will be continuously evaluated on-ground against captured images and GPS data. During all steps of the IRIDES experiment, it will be possible to abort by commanding a simple delta-V along-track. This will result in an increasing distance between Mango and the rendezvous object for an extended period of time. The proposed strategy will allow for a completely safe close approach between Mango and the rendezvous object. The final minimum relative distance depends on the evaluated achieved Vision Based navigation performance. With a performance close to what has been achieved during previous PRISMA experiments, the final safe relative distance could be as close as 10 m allowing for image capturing of the rendezvous object where a pixel would represent 4 x 4 mm with the Vision Based Sensor and 3 x 3 mm for the digital video system (Ref. 40). - The funding of mission operations was always a problem. In an effort to extend the use of the satellites and enable more experiments, DLR/GSOC offered to temporarily operate the satellites from their control center in Oberpfaffenhofen, Germany, for a period of five months during 2011, leading to the first phase shift of the mission into the "extended mission phase". Since the extended mission phase contained a finite set of predefined experiments, the phase ended when all activities were concluded and the satellite was returned back to OHB-SE. - The "external parties mission" was designed such that any interested organization was invited to participate in the mission and conduct its own experiments according to its own needs and requirements, at the time when the satellite was already in orbit. However, the external parties phase also contained extended periods of idle time where the satellite was idling, waiting for new partners to come perform newly defined experiments. This idling time enabled the mission management to start planning for the grand finale, the final phase, where the Mango-Tango formation were supposed to be broken and Mango to start a journey on its own towards a space debris object to demonstrate rendezvous and inspection technologies with a non-cooperative space debris target. - This last phase shift was recently conducted (start in April 2013) when the final phase was initiated by terminating the Tango spacecraft and large dV-maneuvers are applied to the Mango spacecraft to start approaching another object. The final phase is divided in several parts; transfer start, transfer orbit, transfer stop and debris orbit alignment, and finally the debris inspection part which is called IRIDES (Iterative Reduction of Inspection Distance with Embedded Safety). The IRIDES phase is expected to last until December 2014. 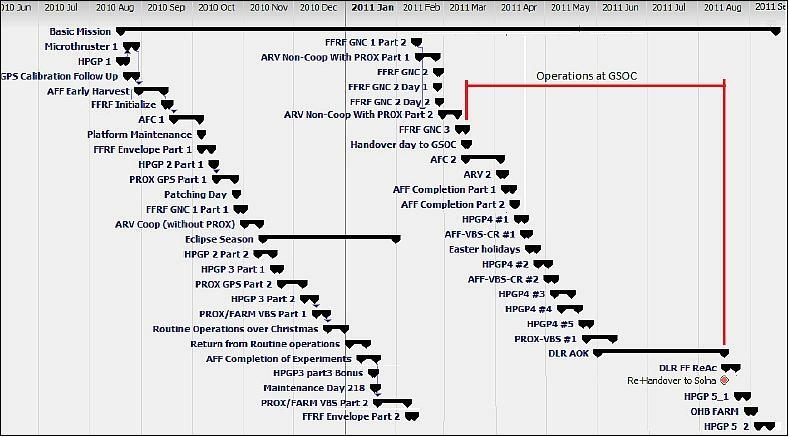 This phase is divided into five parts according to Figure 14, which shows the current timeline planning. Only very limited resources are available to conduct this part of the mission. To meet these constraints, only daytime passes are considered which will be supported by the KSAT network. Furthermore, the number of passes has been limited to two passes/day during the high activity campaigns, and only four passes/ week during the non-campaign periods. The goal of this phase is to abandon the Tango spacecraft and to reorient the Mango orbit in several steps to finally align with a space debris object. This is foreseen to take approximately two years since the available amount of propellant is limited, and relative orbit drift rate with the debris object must be kept small, not to exceed the ?V budget. When the Mango orbit is neatly aligned with the debris, the IRIDES inspection phase will begin. In retrospect, a lot of experience has been gained from the mission, and the decision to transfer to and inspect a space debris object in orbit further demonstrates the capabilities of Prisma (Ref. 41). - The results from the PRISMA mission clearly show that HPGP provides numerous benefits over monopropellant hydrazine, including: 32% higher volumetric efficiency and 8% higher missionaverage specific impulse, significantly reduced transportation/handling hazards and costs, and greatly simplified/shortened pre-launch operations. All this comes with the added benefit of retaining heritage propulsion system architectures, components and skillsets used for conventional hydrazine blow-down systems (Ref. 43). Mission operations are under responsibility of OHB-Sweden AB (former Space System division of SSC), as well as the marketing of PRISMA to attract new "customers". 1) In-flight simulated radar interferometry experiment, where one satellite simulated the SAR transmitter and receiver, while the other the receiver only. This experiment demonstrated, that speed estimation accuracy can reach 0.05 m/s, while in a similar cross-track constellation, with similar orbital parameters, the vertical accuracy of the digital elevation model production could reach 1 m.
2) Observation of non-cooperative objects - space debris experiment (Orbit identification and Close observation in order to derive a 3D model of the observed object). This experiment demonstrated, that space debris, a serious problem in near future, can be identified on the basis of the TLE data and optically tracked by a narrow FOV (14o) camera. 3) In-flight simulated distributed instrument experiment, where the first satellite simulated the holder of the optical system with lenses and/or mirrors and the other one the holder of the detectors (sensors). This experiment has shown, that very precise orbit maneuvering and navigation, required for exact focusing, cannot be achieved by the implemented thruster-control and GPS navigation technology. - PRISMA has more than 50 m/s of remaining ?V capability at the end of the nominal mission (Aug. 2011). This has allowed the project to invite PRISMA as well as external participants to suggest additional experiments. - In September 2011, several such additional experiments are being prepared. These include GPS-based rendezvous motion shaping with simultaneous VBS data collection, Mango/Tango line-of-sight pointing, and combined VBS/RF navigation and control. The project has plans to to continue the mission extensions activities until June 29, 2012. Between March 15 and August 23, 2011, PRISMA was operated from GSOC (German Space Operations Center) as part of an agreement between the SNSB and DLR. The purpose was to provide an opportunity to gather experience in operating multi-spacecraft missions while completing the experiments from the nominal PRISMA timeline. 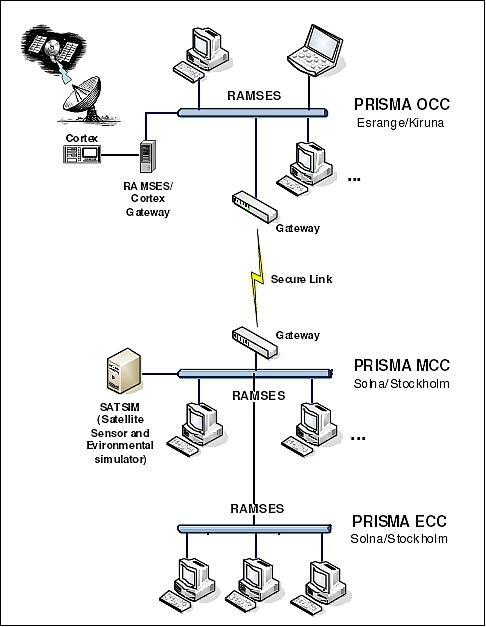 A complete operational environment based on OHB Sweden's command and control software RAMSES was cloned and installed at GSOC and operators were trained during PRISMA operations at OHB Sweden. During this period, the entire operations were transferred to GSOC in Germany and the satellites were operated by GSOC personnel. During this time, several DLR experiments were completed but also several experiments of OHB Sweden as well as of ECAPS (Ecological Advanced Propulsion Systems, Inc.), Washington, D.C. The in-space flight demonstration of the HPGP propulsion system was comprised of commissioning, four blocks of specific HPGP firings and a combined operation with the HPGP and hydrazine systems firing during different formation flying experiments. - On June 23 2010, eight days after launch, the commissioning of the PRISMA HPGP propulsion system was performed as planned. - The first in-space firings were performed on June 24, 2010. The first firing sequence was a pulse train of forty 100 ms pulses at a duty cycle of 1%. The firing was performed along-track and GPS data verified the predicted 2.1 cm/s ?V increase. The propellant consumption for the maneuver was nominal. The HPGP propulsion system was thus declared ready for operations. Single pulse (single pulses or very low duty factors). Future small satellite missions will benefit from HPGP due to its improved density impulse over hydrazine and significantly simplified pre-launch activities. From a performance perspective, the HPGP system is able to offer approximately 36% more propellant than hydrazine for any mission ?V. This allows more margin to be added to the mission lifetime, a larger ?V to be executed or a reduced tank size of the propulsion system, all of which are important criteria for any small spacecraft mission (Ref. 52). • On April 5 and 6, 2011, PRISMA performed the ARV (Autonomous RendezVous) experiment, this time under control by GSOC, and the experiment team residing in Stockholm. For this purpose, AFF (Autonomous Formation Flying) was used to create a distance of 30 km between Mango and Tango, and then Mango was released with a set of commands to start its ARV experiment. The goal: to autonomously detect Tango with the Vision Based Sensor, establish an estimate of its orbit, and maneuver to it until only a distance of 50m remains. All this without any intervention from ground operators and more over on optical line of sight information only. The experiment lasted almost 30 hours, part of which was not possible to monitor from the ground when no visibility from the ground segment was available. The network of ground stations consists of the DLR antennas at Weilheim and the antennas operated by SSC in Sweden. Ten times a day, the two PRISMA satellites, Mango and Tango, transmit signals to the receiving stations and receive new commands from Oberpfaffenhofen. Three teams work there in shifts, looking after the flight control systems. • The PRIMA mission is fully operational in 2011. 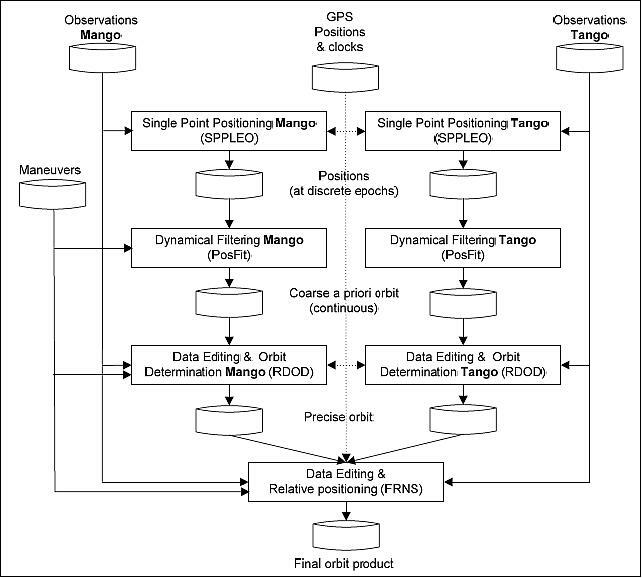 • Proximity GPS approach to 2 m in Dec. 2010: Two successful Mango approaches toward Tango were conducted on Dec. 22 where the closest distance was 2 m. Mango was controlled to within 0.3 m from the commanded approach and recede trajectory. This was a part of the SSC PROX GPS experiment, where the guidance and control have been developed by SSC and the GPS navigation by DLR. Ultimate navigation performance is achieved by complementing the hardware with a real-time onboard navigation filter which processes the GPS raw measurements to provide absolute navigation accurate at the meter level and relative navigation better than 10 cm. The onboard filter presents also the ability to bridge short data gaps in case of hardware anomaly and is as such the indispensable companion of a commercial-off-the-shell receiver. PRISMA shows that a robust and accurate navigation can be achieved by a proper configuration of the filter throughout all the mission phases. Minor outliers in the relative navigation have been detected during certain antenna switches, which will require further investigations in the near future. The PRISMA navigation system is finally complemented on ground with a facility for POD (Precise Orbit Determination), which uses more advanced techniques to generate routinely highly accurate orbit products. The resulting relative positioning accuracy goes down to the sub-centimeter level (Ref. 55). The POD facility at GSOC generates precise orbit products on a routine basis using the DLR's in-house GPS High precision Orbit determination Software Tools (GHOST). • FFRF sensor flight results (first metrology stage for formation flying missions): First flight results appeared to be quite satisfactory. Absolute accuracies of 1 cm on distance and 1o on LOS (Line-of-Sight) are reached in configurations where the signal elevations on Mango and Tango are small. Both LOS and distance IAR processes appear to be less robust to high elevations because of high multipath errors. However, though LOS and distance may be biased, relative accuracy still remains very good. Besides, a multipath calibration process is under way and hopefully will greatly improve the accuracy. In addition to the FFRF sensor characterization, the CNES FFIORD experiment is also testing various GNC algorithms. The first closed loop experiment was fully satisfactory and demonstrated full capability to maintain passively a safe relative orbit (Standby), to perform autonomous rendezvous from kilometers away down to a few hundred of meters, to perform proximity operations with a few cm accuracy and to trigger safe collision avoidance when necessary. - The FFIORD experiment success should thus help to build future FF missions relying on RF metrology like PROBA-3. See the chapter "FFRF (Formation Flying Radio Frequency) configuration on the PRISMA constellation" below which contains most FFRF results of (Ref. 76). - The HPGP-3 pulse trains were performed in the along-track direction to improve the accuracy of GPS data, thus improving Isp performance measurements. - The HPGP-2 firings have been performed with pulse durations from 50 ms up to 60 seconds over a wide range of duty cycles, i.e. from 0.1 to 99 %. Pulse trains lasting up to 90 minutes (90% of the orbit) has been executed. The firings have been performed mainly in cross track and a few along track. Since the beginning of the mission 6800 pulses have been fired during 100 sequences with the HPGP propulsion system. 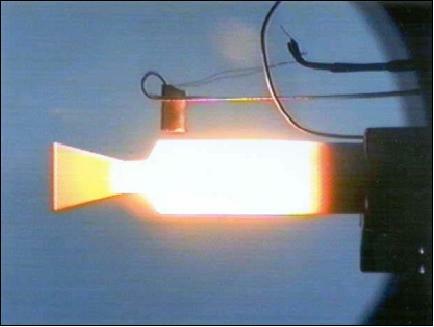 The accumulated firing time is more than 1 hour and 1 kg of the propellant has been consumed. The HPGP propulsion system's operational characteristics are nominal. - Autonomous formation flying in closed loop which is the hub for all future GNC experiments. As a consequence, the PRISMA mission has proven itself to be the formidable test bench for advanced formation flying and rendezvous test bench as expected. Additionally, the new HPGP (High Performance Green Propulsion) propulsion system has demonstrated the desired performance. • AFF (Autonomous Formation Flying): Enabling formation autonomy on PRISMA is a major step for the project. To enable autonomous formation control requires all other subsystems to perform nominally, pointing and momentum offloading for two spacecrafts, electrical and thermal stability, the onboard GPS navigation very precise and stable, thrusters that deliver accurate and repeatable impulses. These are just a few of the subsystems that need to deliver for AFF to be possible. The Autonomous Formation Flying (AFF) experiments consist of passive formation flying based on GPS navigation. The passive orbit is obtained as the natural ideal relative motion between the two spacecraft when their orbits differ slightly from each other. The relative orbit is maintained with a control law based on fuel optimal Model Predictive Control principles using Linear Programming optimization methods. The AFF passive formation flying experiments demonstrate typical mission scenarios which include passive apertures or loose formations. They also represent passive phases and situations occurring within virtual structure formations, on-orbit assembly and on-orbit inspection. • By the beginning of September 2010, all essential equipment on the two satellites has been fully commissioned and the initial parts of the AFF in closed loop has been initiated. Since Sept. 1, 2010, Mango (MAIN satellite) is fully authorized to make its own decisions on when, how long and in which direction it needs to fire a thruster in order to establish and maintain the constellation geometry, commanded from ground. While it is still too early to say anything about the long term performance, during the first 17 orbits (~28 hours) everything was nominal. Two reorientations of the constellation have been performed, the later one involved increasing the distance from about 800 m up to 5 km. This took nine orbits and required three short correction pulses of about 0.6 seconds burn time in total (about 3 mm/s correction in total). This is inline with the validation simulations which have been performed for this scenario. - VBS (Vision-based Sensor) of DTU. 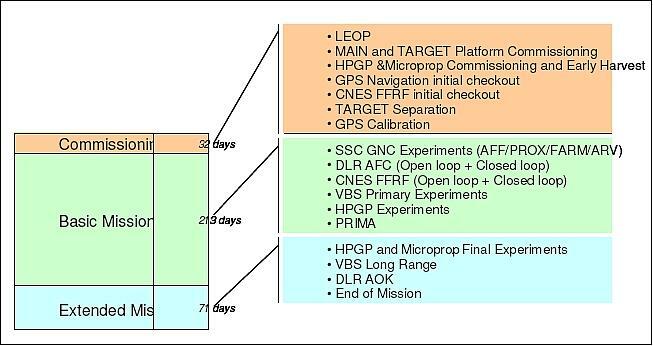 • On Aug. 27, 2010, the fine tuning of the GPS navigation system was conducted for the coming experiments, final checkout of the Safe Orbit Guidance and initializing the relative orbit to a good relative state for the start of the AFF experiments on Sept. 1, 2010. • The MSC (Mission Control Center) of SSC received first contact with PRISMA via the ESRANGE ground station at 16:14 UTC on June 15, 2010. The operations team could verify that the solar array panels had been deployed as planned and that the satellites are in a nominal state. During the coming days, all subsystems on both satellites will be successively verified, leading up to the planned separation of the satellites – Mango and Tango – on August 3, 2010. • Sixteen minutes after launch the CNES satellite Picard was released. This was followed by the release of the two PRISMA spacecraft which were clamped together in the launch configuration (they will remain in this configuration during the first weeks in orbit. The two PRISMA spacecraft were nicknamed Mango (MAIN satellite) and Tango (TARGET satellite). VBS was jointly developed by DTU and SSC. Use of the µASC (Micro Advanced Stellar Compass) of DTU, Lyngby, Denmark. The DTU star camera, used in several space missions [GRACE, etc. ), has the capability to track non-stellar objects and report the direction in global direction vectors. This capability shall be developed such that MAIN spacecraft can find the TARGET spacecraft from several hundred kilometers and deliver sufficient data in order to precisely determine the TARGET spacecraft orbit (either on board or on ground). 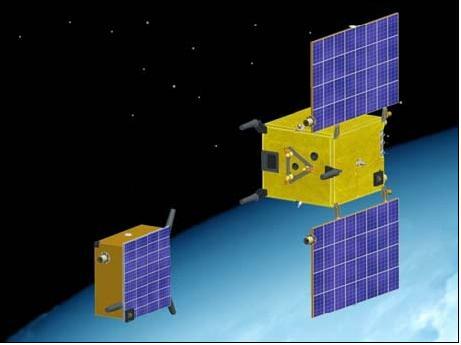 The µASC is being flown on the PROBA-2 (launch Nov. 2, 2009) and the Flying Laptop missions (launch in late 2010). The µASC device is of ASC heritage flown on Orsted, SAC-C, CHAMP, GRACE, ADEOS-2, SMART-1, GOCE, etc. The VBS system is realized as an extension module to an already space proven instrument, the µASC which is capable of fully autonomous delivery of high precision attitude references based upon star observations. 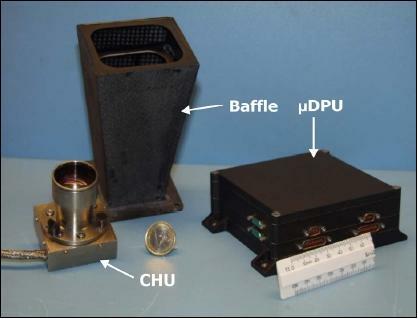 The µASC instrument is physically divided into a µDPU (Data Processing Unit) with hot/cold redundancy and CHU (Camera Head Unit), a µDPU may drive up to 4 CHUs in any cross-strapping configuration. The µASC delivers attitude information at S/C angular rates of up to 10o/s and thus enables rapid repointing of the platform to any object. VBS is being used to identify the TARGET as a non-stellar object at distances up to 500 km, and to track the TARGET down to very close range, typically 10 m during a sequence of autonomously scheduled approach maneuvers. Areas to investigate are, among others, the degree of cooperativeness needed of the TARGET S/C (the TARGET will be equipped with switchable light diodes), the division of functionality between onboard S/W and ground control center, etc. 3) Optical camera-based autonomous navigation. The VBS system on PRISMA consists of a total of four CHUs, all connected to a double µDPU. Two of the CHUs will function as normal double startracker, providing attitude information to the spacecrafts guidance system. The two other CHUs are modified from the standard design, both having an electronic shutter implemented and have the fundamental use of providing the VBS system with image information. One of these VBS CHUs is provided with a standard startracker lens, enabling it also to see stars and therefore also able to determine its attitude pointing. This CHU is denoted as the Far Range (FR) CHU. The other VBS CHU is provided with a smaller aperture and a filtered lens system in order for it to function when the spacecrafts are flying in close proximity. This CHU is denoted as the Short Range (SR) CHU. VBS mission results: An extended functionality of the µASC, called the Vision Based Sensor (VBS), enables the camera system to render rendezvous and docking navigation information for a formation flying spacecraft. The VBS system facilitates different operation modes, enabling 6DoF solutions for spacecraft flying in close proximity, and inertial LOS (Line of Sight) solutions for any spacecraft reflecting more light than an Mv7 star. The VBS on the PRISMA mission functions as a part of the instrument package forming the rendezvous and docking navigation test bench for the Main spacecraft. Here the VBS system has been enabled, based on the scheduled flight maneuvers in between the two spacecraft, autonomously providing the Main spacecraft with pose and position or LOS information of the Target spacecraft. During different phases of the mission, full centroid information was captured from the CHUs (Camera Head Units ) of the µASC, which for these periods have enabled on-ground VBS reprocessing and deeper investigation of the detected objects and their statistical occurrences. The VBS system is capable of providing high accuracy inertial pointings of all tracked objects in combination with key tracking information, that can be used for determine the confidence and precision of the detected object. Furthermore, dependent on which NOS objects that are of interest to search for, different boresight pointings relative to the flight path have shown a wide coverage range for the tracking of fast and slow moving NSOs. By providing inertial pointing towards any NOS to a GNC core, approach maneuvers can easily be performed in the right direction. The VBS system is fully autonomous and can detect objects as soon as they can be detected by the star tracker CHUs. This is especially useful for missions with limited commandability, such as e.g. the Sample-Return missions. 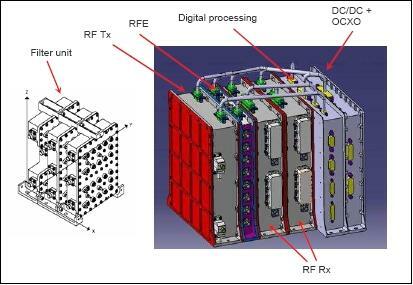 • FFRF (Formation Flying Radio Frequency) sensor, a metrology subsystem developed by TAS (Thales Alenia Space), France (formerly Alcatel Alenia Space France) and sponsored by CNES. FFRF is to be validated on PRISMA; it is currently under development for the PROBA-3 and Darwin missions of ESA as well as for the SIMBOL-X mission of CNES/ASI. • Data interfaces for FFIORD GNC flight software. The objective is to use the FFIORD passenger experiment as a coarse formation flying sensor for formation establishment down to the centimeter level, and collision avoidance. One FFRF device is mounted on each spacecraft in the formation of PRISMA. It uses a dual-frequency S-band communication link and a set of nominally seven antennas on each S/C. The position and direction to the neighboring units are calculated by means of measurements of pseudo-ranges and carrier-phase measurements for ranging, and single difference of carrier-phase measurements for direction. The requirements call for a dynamic range of FFRF between 100 m to 30 km. The objective is to validate the sensor performance in acquisition time, stability and accuracy at different ranges and dynamic conditions. A flight test is especially important with respect to multipath phenomena. The FFRF sensor may also be used to test advanced GNC functions in closed loop intended for the future Darwin mission. The FFRF tests are being conducted by the CNES team. The FFRF subsystem is in charge of relative positioning of 2 to 4 satellites on formation flying missions. It produces relative position, velocity, and LOS (Line-of-Sight) as inputs for the GNC subsystem for which it provides coarse metrology measurements. As the first element in the metrology system chain, the FFRF sensor ensures initial good relative navigation accuracy for the subsequent optical metrology subsystems (coarse optical lateral metrology, fine optical metrology, and fine longitudinal metrology). The FFRF subsystem hardware consists of one terminal and up to 4 sets of antennas on each satellite in a constellation. Measurement principle: The FFRF subsystem relies on an architecture inspired by GPS technology. Using multi-antenna bases and TDMA sequencing, each terminal transmits and receives a GPS C/A navigation signal modulated on two S-band carrier frequencies (S1 and S2) with BPSK/QPSK modulation. Since every terminal is equipped with transmitter and receiver, each satellite is then able to make ranging and LOS measurements with every other satellite. On S2, ISL (Inter Satellite Link) data are in quadrature with the ranging signal. Frequency band: ITU regulations showed that the only frequency band where space-to-space communication could be done below 10 GHz is by sharing the TT&C band in S-Band (2025 - 2110 MHz and 2200 - 2290 MHz). For PRISMA, the resulting frequency plan was selected, putting the FFRF frequencies in the upper end of each part to the TTC band (Figure 23). The frequencies selected after these criteria are: S1 = 2275 MHz and S2 = 2105 MHz, while the TM is at 2214 MHz, the TC at 2035 MHz, as far apart as possible from S2. In addition, the signal at S2 has a deduced power compared to S1 so as not to interfere with the TC. Signal characteristics: Location measurements are made with GPS. Using multi-antenna bases (triplets) and TDMA sequencing, each terminal transmits and receives a GPS C/A navigation signal modulated on two S-band carrier frequencies. On the first frequency, there are also data modulated in quadrature, on the second frequency, S2 the navigation signal has a reduced power. • Clock bias between the two satellites. Since every terminal is equipped with both transmitter and receiver, each satellite is then able to make ranging and LOS measurements with every other satellite. First, coarse measurements are made using the ranging from the C/A code, and then fine measurements with centimeter accuracy are performed using carrier phase measurements. The dual frequency allows the system to perform carrier ambiguity resolution using a wide lane, while 2-way measurements are used to account for the relative clock drift of the platforms. LOS measurements are made by measuring the carrier phase difference between the master and slave antennas on the triplet antenna base. Attitude, though, has to come from an external attitude sensor such as a star tracker. On PRISMA, the TARGET satellite has only three Rx/Tx antennas on different facets to ensure full space coverage. 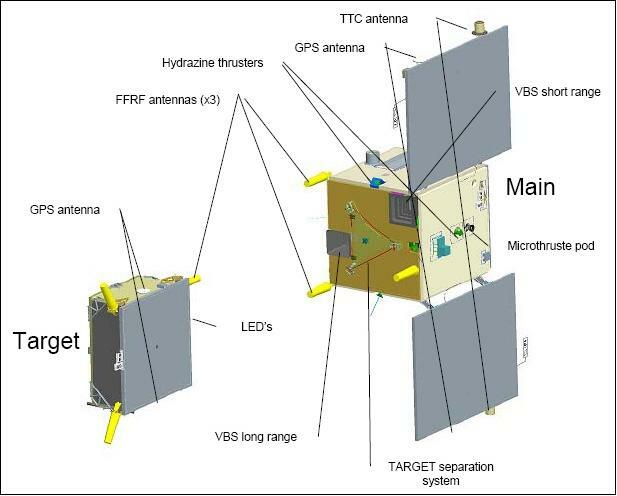 Thus only the satellite MAIN, which is the only one equipped with a full antenna triplet, will perform the PVT (Position, Velocity, Time) algorithms to determine the precise positioning of satellite TARGET. Navigation function: The RF navigation function, running at 1 Hz, estimates the relative position and velocity of the Mango satellite in the local orbital frame attached to Tango. This function is always active whenever the FFRF sensor is running: it is used in open loop during the sensor commissioning/characterization phase and in closed loop during the CNES FF experiment. The estimation algorithm relies on an extended Kalman filter that includes an absolute dynamics model of each spacecraft. 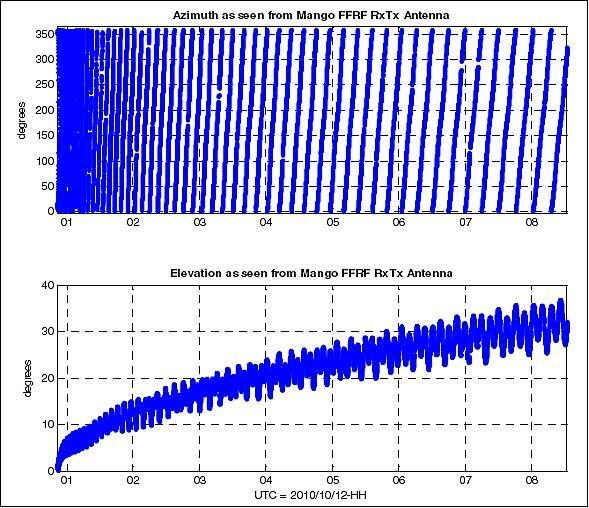 Two FFRF flight models (FM), one for Mango and one for Tango, were integrated into the PRISMA satellites in October 2009. Since the antenna configurations are not symmetrical on Mango and Tango, the FM architectures differ slightly (Figure 25). 1) Passenger experiment: the spacecraft attitude and the relative trajectory are defined by the primary experiment and the data rate is rather limited for the passenger. Such experiments allow for FFRF sensor commissioning, routine characterization and extensive data collection any time opportunities are offered. The CNES RF navigation function can also be enabled during a passenger experiment. The passenger experimental slots were not considered during the overall FFIORD scenario definition process since the priority is given to the primary experiment and there is no guarantee for the passenger. However they offer a real plus value of the PRISMA mission and the first FFIORD passenger experimental slot was shown to be extremely fruitful when performing preliminary FFRF sensor commissioning. 2) Primary Open Loop Experiment (OL): during those experimental slots the spacecraft attitude and the relative trajectory are defined by the primary experiment but achieved using the PRISMA services (GPS based navigation function and Autonomous Formation Flying guidance and control function for the trajectory). It is used for the FFRF sensor full validation (calibration included) and also for testing CNES GNC functions in open loop. 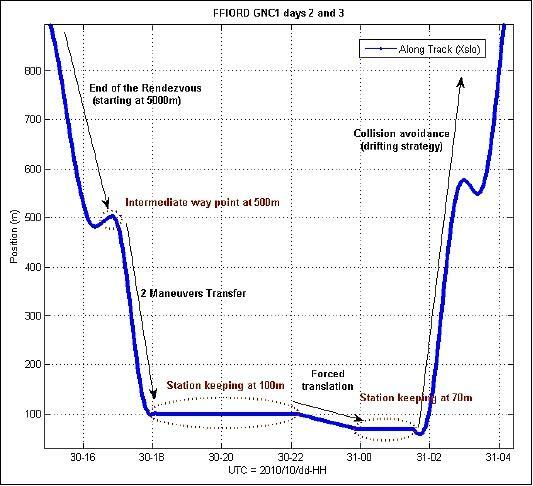 3) Primary Closed Loop (CL): during those experimental slots the spacecraft attitude and the relative trajectory are defined by primary experimenter and the relative trajectory is achieved using experimenter GNC algorithms. It is dedicated to the FFIORD FF experiments. B. FFIORD Experimental Activities. - The FFRF and GNC activities, to be performed during FFIORD experimental slots, are summarized hereafter. a) Acquisition time: objective is to characterize the RF signal acquisition time (typical time is less than one minute) by periodically resetting the equipment and wait for 5 minutes. This test is to be performed within various relative geometries (LOS, distance) spanning the whole PRISMA allowed flight domain, with or without aiding data provided by GNC and for different Tango FFRF antennas in visibility. b) Acquisition tracking thresholds: objective is to characterize the distance where the RF signal is lost (resp. reacquired). Typical distance is 3 km in Low Power, and 30 km in High Power. This test is to be performed on a slow drifting orbit with increasing (resp. decreasing) distance. c Antenna handover: objective is to characterize the handover between Tango's 3 Rx/Tx antennas (which is autonomously performed) by setting Tango on a 360o rotation during 2 orbits. This test is to be performed at close distance (resp. far distance) in Low Power mode (resp. High Power mode). d) Integer ambiguity resolution: objective is to validate IAR process on the LOS measurements as well as on distance measurements. The IAR on LOS consists in performing a 50o rotation along the Mango antenna bore sight axis during a few minutes. This test is to be performed for various azimuth / elevation to assess the robustness of the process with respect to multipath environment especially at high elevations. 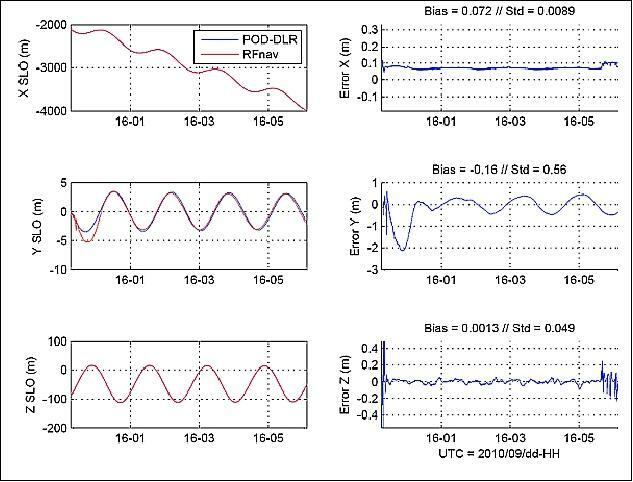 Following LOS IAR, distance IAR consists in letting the sensor filter the measurements over roughly 15 minutes to remove ambiguities on WL phase and F1 CP. The distance IAR (Integer Ambiguity Resolution) tests will be performed under various azimuth / elevation. e) Performance: performance tests simply consist in letting the sensor run over long periods of time (many orbits) so as to assess both LOS and distance measurements performance by comparing with the GPS post processed data. It will enable distance and LOS bias calibration. f) Multipath characterization: a cartography of multipath errors (for both LOS and distance) will be drawn and compared to the one obtained on-ground. Aim is to build multipath correction tables that will be uploaded within the instruments to improve final performance. This test requires to sweep a wide range of azimuths/elevations. On Mango side this will be performed by following a spiralling attitude profile, starting from a null elevation and progressively increasing this angle, while spinning around the antenna line of sight axis. On Tango side the attitude control subsystem does not allow for such an agility. Hence the test will be performed by setting Mango in Tango Pointing attitude mode, and by following a relative trajectory approaching Tango with increasing cross track and radial amplitude (one can think of a screw driver trajectory with a continuously increasing amplitude). g) Ionosphere impact: the purpose is to assess presence of ionospheric bias as well as to evaluate the potential ionospheric variation over an orbit. The principle consists in comparing the relative evolution of the three distance raw measurements (code and carrier phases at frequency 2275 MHz, carrier phase at 2105 MHz): a relative drift will mean ionosphere error is not negligible. This test is almost continuously performed in parallel with the performance oriented tests. 2: GNC activities: The GNC activities are intended to validate formation flying algorithms. a) RF navigation: the Radio Frequency based navigation is permanently active when the FFRF sensor is powered on. During the FFRF sensor oriented tests the RF navigation function will be commissioned and tuned to improve accuracy. During the CNES closed loop experiment it will serve as input for the guidance and control algorithms. b) Standby (SBY): this function is in charge of passively controlling Mango on a safe relative orbit with respect to Tango. Typical delta-V period is one per orbit, and typical relative distance is 300 m with an amplitude of the ellipsoid orbit of 20 m cross track and 20 m radial. c) Proximity operations (PROX): the associated guidance and control functions are in charge of performing forced translations and station keeping in the vicinity of Tango (a few tens of meters). d) Rendezvous (RDV): the rendezvous guidance function affords an autonomous capacity for safe rendezvous or deployment from a distance of about 10 km to 100 m. It is based on model predictive like control method with maneuver dates fixed on ground. e) 2-maneuver transfer (2MT): this function performs a transfer between two relative Mango states (position and velocity) using two impulsive open loop control maneuvers and a defined drift period. f) Collision avoidance (CA): if the Mango spacecraft enters into the Tango safety sphere, this function computes one instantaneous open loop maneuver (and a second one if this option is selected) that transfers the Mango spacecraft onto a relative orbit staying outside the safety sphere. The first option that can be considered consists in setting a relative drift between Tango and Mango. It appears to be very simple and very robust. The second option is inspired by geostationary spacecraft collocation and phases radial and normal separations so that when one of them cancels, the other one is maximal. Table 7 and Table 8 synthesize the FFRF and GNC activities and mention the number of executions for each of them. They clearly show the intensity of FFIORD activities onboard PRISMA. Finally, Table 9 summarizes the experimental slots allocated to FFIORD and the activities accommodated during those slots. For the first time, the RF link was established between the two FFRF terminals. FFRF distance was initially based on smoothed code measurements (IAR was not yet performed). Post-processing of the data and comparison with the GPS POD showed a very good accuracy, prior to any FFRF distance calibration (40 cm bias and 3.8 cm noise). LOS (Line-of-Sight) accuracy could not be assessed yet as it required satellite rotation. The experimental slot consisted in a thorough functional commissioning of both FFRF sensor and RF-based navigation. Both proved to be very satisfactory. In the last part of the scenario, multiple rotations of Mango around Tango were performed so as to test antenna handover on Tango FFRF. The objective of the test was twofold: first test antenna switching when RF link is established; second test cold start acquisition when signal has been lost. Both tests turned out to be successful. As for acquisition time (Table 10), it depends on Tango's antenna in visibility of Mango. Typical duration is between 50 to 60 seconds. Note that at the end of the acquisition time, the distance output by FFRF is based on code measurement. Final accuracy requires IAR process which lasts for 15 minutes. 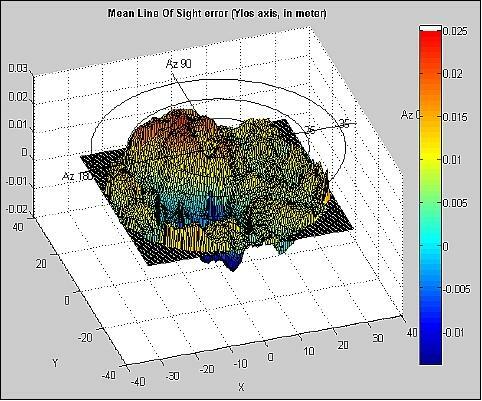 B. FFRF Init: This experimental slot was dedicated to characterization of FFRF sensor (acquisition time, LOS and distance performance) and RF-based navigation. 1) Acquisition time. All 32 acquisition tests were successful. They were all performed with Tango's FFRF antenna #1 in visibility. Minimum acquisition time was 42 seconds and mean acquisition time was 45 seconds. 2) LOS performance. 17 motion-aided LOS IAR tests were performed. For small elevations (< 30o) tests were successful. However ambiguity resolution failed for higher elevations. This was unexpected as tests performed in CNES anechoic chamber had all been successful even for elevation up to 80o. This abnormal behavior is currently under investigation. When LOS IAR is successfully performed, resulting LOS is very accurate. For small elevations (< 30o) mean error is equal to 0.8o (this bias will be calibrated) and the standard deviation is equal to 0.2o. 3) Distance performance. The distance IAR process is very sensitive to biases (code, WL, CP) which are not calibrated. Indeed important biases on code and WL measurements cause WL IAR to fail. This results in a bias of 90 cm on final distance. However, the relative distance is very accurate with a standard deviation equal to 1 cm. 4) RF navigation. In parallel with the FFRF sensor tests, the RF navigation function was activated and showed excellent results when the Mango attitude mode was set to Tango pointing (FFRF elevation close to 0o). The navigation errors appeared to have a standard deviation of a few cm on the along-track (X) and nadir (Z) axis when comparing with the GPS POD (Figure 26). The cross track error (Y) is bigger since there is no dynamic coupling between the cross-track component and the accurate FFRF distance measurement. C. FFRF envelope part 1: In this second FFIORD primary experiment, FFRF and the RF-based navigation characterization were carried on. In addition the first multipath calibration was performed. 1) LOS performance. A lot of motion-aided LOS IAR were performed (52). The results confirmed the tendency observed during the INIT scenario. All 18 tests with elevation less than 35° were successful. However, for cases where elevation is greater (tested up to 57o), 19 IAR out of 34 failed. As previously, when the IAR was successful, the LOS accuracy is less than 1o, otherwise the error can reach 20o. 2) Distance performance. As for distance, IAR process appeared to be very sensitive to elevation angles. Multipath error magnitude increases with elevation on Mango or Tango and causes IAR to fail. At worst distance error can reach 90 cm. Without multipath calibration tables, alignment of satellite (i.e. elevation close to zero) is necessary. In that case error is less than 2 cm. 3) Multipath calibration. To improve IAR robustness we need to calibrate multipath error in function of azimuth/elevation (for both LOS and distance). The first multipath characterization was performed during this scenario thanks to a specific attitude profile (Figure 27). Error mapping for y-component of LOS vector can be seen in Figure 28. It ranges from -1 cm (-0.6o) to 2.5 cm (1.5o). Assuming that the other error contributors are negligible (Tango residual attitude movement inducing more multipath effect, Mango attitude estimation error, POD error, geometrical uncertainties ....) then this kind of computation gives access to the multipath error on Mango. The results are not available yet for the distance error as post-processing is more complex (it requires to remove other perturbing error contributors). During GNC1 experimental slot, formation flying in close loop was performed for the first time. All FFIORD GNC functionalities were successfully demonstrated : maintain passively a safe relative orbit (Standby), perform autonomous rendezvous from km away down to a few hundreds of m, perform proximity operations with a few cm accuracy and trigger the safe collision avoidance when necessary. As an example, results from day 2 and 3 of GNC1 are presented (Figure 29). It started with an autonomous Rendezvous from 5000 m away from Tango to reach an intermediate way point at 500 m along-track. Once arrived at this way point, a 2-Maneuver Transfer was computed and executed to go down to 100 m along-track. One trim maneuver was required to improve accuracy and precisely reach the goal ([1 cm, 1 m, 50 cm] error respectively along-track, cross-track and radial). The Proximity module was then activated to do station keeping at 100 m from Tango. The accuracy of this station keeping phase was very good. The RF navigation estimation showed a control error of 2.6 cm standard deviation along track, 12 cm cross-track and 5.7 cm radial. The next phase consisted in going down to 70 m by following a forced trajectory and doing some more station keeping. Once again the behavior was very good. Within the scenario a collision avoidance triggering had been planned to demonstrate the capability to safely go away in case anything goes wrong. It was successfully executed. This scenario is very typical of the formation acquisition and reconfiguration that will be performed by future formation flying missions (e.g. telescope distributed over 2 satellites): the chaser spacecraft (e.g. detector satellite) shall autonomously acquire the formation from the post launch initial conditions and progressively reach its nominal position at a specific distance from the target spacecraft (e.g. at the focal point located a few tens of meters behind the focusing satellite), then it shall reduce the control box within a few cm to allow for stabilized observation. If necessary a transition to a more accurate optical metrology stage shall be performed so as to offer 1 or 2 orders of magnitude improvement on the state estimation accuracy and on the control error. Reconfiguration of the formation baseline (e.g. focal length reduction or telescope reorientation) is to be performed with forced trajectory like movements. With FFRF (Formation Flying Radio Frequency), CNES provided a new metrology subsystem designed for future outer space FF missions and some on-board GNC software to perform a variety of formation flying experiments. The FFRF Sensor is a distributed instrument designed to provide range and LOS (Line Of Sight) measurements at 1 Hz with a targeted accuracy of 1 cm and 1°. 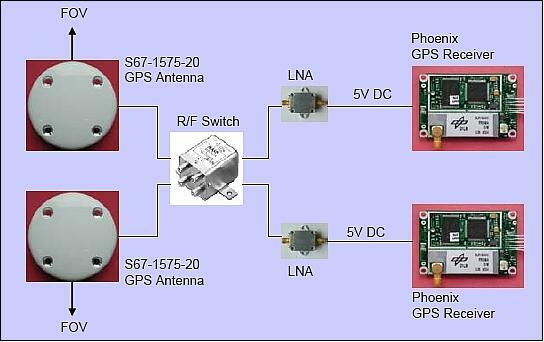 Its functional principle is inherited from a GPS receiver using dual frequency S-band signals. Its operating range is 3 m-30 km and its behavior has been characterized in flight over most of that domain. In its current design and accommodation, its main limitation comes from its sensitivity to multipath that may lead to initial range biases up to 1 m and bearing bias variations in the 0.5° range for 30° attitude changes. During the nominal mission, this instrument allowed anyway to achieve the various formation acquisition and formation-keeping objectives and demonstrate forced positioning with 1 cm stability. 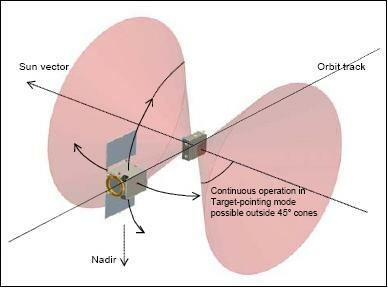 The Vision Based Sensors (VBS), whose design is derived from the µASC (Micro Advanced Stellar Compass) star tracker, have been specifically tailored to achieve two complementary navigation purposes: long distance detection and tracking of a moving target , VBS FR (VBS Far Range), relative position/attitude estimation of a cooperative target, VBS CR (VBS Close Range). The Close Range camera (CR_VBS) detects the signal of the LEDs (Light Emitting Diodes) located on the Tango satellite. The CCD coordinates of all luminous objects are extracted and the detected pattern is compared with the model stored in the database. To improve robustness, the camera optical pass band is narrowed using a filter centered on the LED wavelength but the whole satellite remains visible. The instrument operates up to 40-50 m and delivers a localization estimate at 1 Hz with an accuracy that depends on the lighting conditions (a sub-millimeter accuracy for the position and below 1° for the relative pose was achieved in laboratory conditions at 10 m distance). In the nominal mission, this instrument allowed OHB-Sweden to achieve forced positioning with 1 cm accuracy at 10 m range. The Far Range camera (FR_VBS) is a star tracker operating in a particular mode. In Far range mode, the camera processing unit is capable to detect the luminous objects that do not belong to the star catalog and that can be robustly spotted as potential orbital targets after a few acquisition cycles given their apparent motion. At long range, since stars are visible in the field of view, the camera can deliver an attitude quaternion that helps to get rid of the camera bias alignment problem. At smaller range, the target luminosity increases and the activation of the electronic shutter is necessary to avoid blooming effects (Intermediate mode) which limits the capability to estimate inertial attitude. At short range, the target becomes a large blob in the field of view and the camera processor uses some image processing algorithm to extract characteristic satellite feature and estimate the direction of its center of mass. Given the stringent lighting conditions, the robustness of this process is potentially weak and direction biases are likely to be observed. The Phoenix GPS receivers allow to perform on-board relative navigation with an accuracy in the 10 cm range and this information is used to perform some FF experiments and ensure PRISMA formation safety in all circumstances. In addition, the raw GPS measurements processed on the ground allow to perform Precise Orbit Determination (POD) and reach a relative accuracy in the sub-cm range. 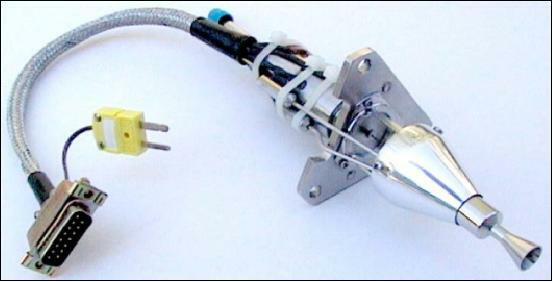 The propulsion system used for the FF and rendezvous experiments relies on 6 hydrazine 1N thrusters with a 0.7 mm/s MIB (Minimum Impulse Bit) at the mission start. Most maneuvers require the use of at least 2 thrusters, which push the effective MIB in the 1 mm/s range. This resolution level outline, the challenge of reaching the centimeter positioning accuracy , constituted an important performance limiting factor during the experiments with FFRF and CR_VBS. The PRISMA extended mission enabled CNES to pursue its demonstration effort that was initiated in the formation flying domain and focused on radio-frequency navigation. Three new experiments were performed to exercise more challenging tasks in formation flying as well as autonomous rendezvous and this involved the addition of optical sensors in the loop. 1) The first experiment brought additional evidence that vision based navigation in LEO (Low Earth Orbit) represent a valid technique to perform rendezvous with non cooperative objects. Four consecutive rehearsals with ranges up to 10 km down to 50 m were successfully performed under realistic conditions of initial uncertainty. Using collected flight data, complementary runs in replay mode have also shown the technique robustness in the presence of data loss and larger uncertainty as well as its potential of improvement through some limited adaptation. 2) The second experiment involved transitions between RF and optical metrology at short range in several scenarios to acquire knowledge on the metrology, navigation and control issues that could occur in similar phases during future formation flying missions. Even though the second stage was not a real FF sensor candidate, the successful experiment allowed to exercise in the real world the filter tuning tasks and increase the maturity level of the software involved. 3) The third experiment enabled to emulate the type of maneuvers that will be required in future astrometry FF missions represented by the NEAT (Nearby Earth Astrometric Telescope)/µNEAT concepts. The formation was pointed successively to a set of celestial targets and the configuration was maintained fixed during time slots representing observation phases with a control stability better than 4 cm (1?). Under such stringent environmental and operational constraints, the good functional behavior and performance level constitutes a blatant illustration of the margins that should be available when going on a higher orbit and using finer equipment for both metrology and actuation. The results of these experiments are important for future applications; they illustrated in particular their relevance for the active debris removal domain. Here, a representative mission scenario spanning the rendezvous and inspection phases was implemented on a numeric simulator that was built within a short timeframe using the output from three experiments: (1) the GNC system relied entirely on functional bricks developed and already flight validated; (2) the collected metrology data allowed to improve the fidelity of the sensor models. The simulation results presented illustrate the continuing work and outline the value of the PRISMA/FFIORD heritage. 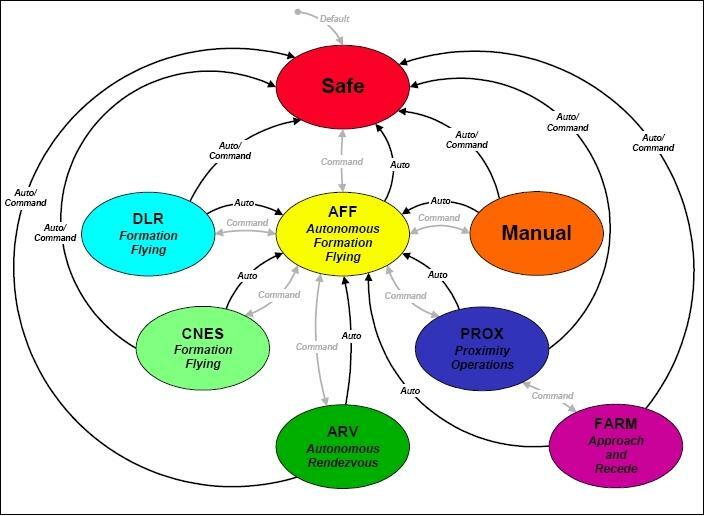 As regards future formation flying, specifically challenging missions such as NEAT, another possible work axis may consist in reusing the RF metrology data in order to extrapolate the system behavior during the formation acquisition and re-pointing phases with different spacecraft and environment characteristics. This modest effort would allow to anticipate the achievable level of performance with the current technology on less perturbed orbits and participate to the promotion of these missions. Nothing will replace, however, the demonstration of positioning accuracy down to the millimeter range as it is envisioned for the future PROBA-3 technology mission of ESA. 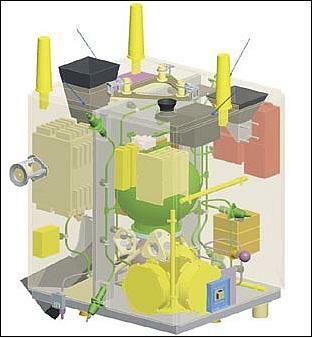 • Hydrazine RCS, designed by SSC: It has six 1 N thrusters. The propellant tank contains 11 kg of usable fuel and gives approximately 120 m/s ?V over the mission. The instrument, mounted onto the MAIN spacecraft, features two 1 N thrusters such that a torque-free motion can be created in all directions (this is equivalent to six traditional hydrazine thrusters). The HPGP propellant tank contains 5.6 kg fuel and gives approximately 60 m/s ?V over the mission. - To increase the eccentricity of the orbit. The system shall demonstrate performance by both steady state burns up to 30 seconds, down to minimum impulse bits of 0.1 Ns (requested typically at autonomous formation flying and proximity operations). The new monopropellant for HPGP is based on ADN (Ammonium Dinitramide); the monopropellant LMP-103S is a blend of ADN (NH4N (NO2)2), water, methanol and ammonia. ADN is the oxidizer which is dissolved in water with methanol and ammonia as fuel components, where ammonia also acts as a stabilizer. The theoretical specific impulse (Isp) for LMP-103S is: Isp = 2477 Ns/kg (or Isp = 252 s) for an expansion ratio of 50:1, which is approximately 6 % higher than for hydrazine. The density for LMP-103S is 1.24 g/cm3 at 20oC (24% higher than hydrazine), which results in a density impulse which is 30 % higher than for hydrazine. Research and development of ADN began in 1997 as a co-operation between SSC and the Swedish Defence Research Agency (FOI). The objective was to develop a propellant, which is safer and has better performance than hydrazine (hydrazine is highly toxic and carcinogenic; it is also volatile and very reactive). 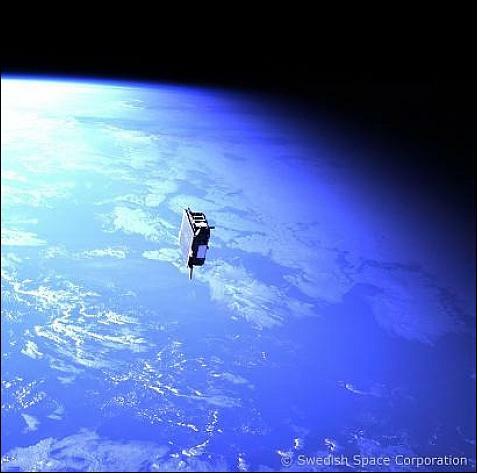 The R&D work has been performed under contract from SNSB (Swedish National Space Board) and ESA. The thruster pod, which differs significantly from a conventional cold gas thrusters, does in this case contain four individual mN (milli Newton) thrusters arranged in-plane and orthogonal to each other. The thruster pods include filters, heaters, and temperature-sensors. This offers a significantly reduced size and mass compared to four conventional cold gas thrusters. The thrusters are manufactured in MEMS technology in stacked silicon wafers with integrated thruster valves and a thrust feedback measurement system. The stack contains 4 orthogonally located thrusters, each integrated into a thruster pod. The pod system has approximately the size of a golf ball (Figure 35). - Use of post processed GPS-data for precise orbit determination. 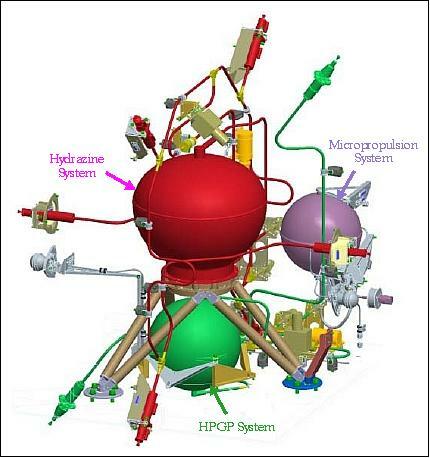 Legend to Figure 36: Hydrazine = red color; HPGP = green, Micropropulsion = purple. The implementation on PRISMA (MAIN S/C) employs 2 pod systems in an arrangement such that all thrusters can be fired. The performance of the microthruster system will be measured by means of disabling the attitude control loop of the MAIN S/C and to register the attitude motion caused by the thrusters. - The cold gas micro-thruster tests are performed only open-loop through ground commands. The response is registered by post-analysis of the momentum build-up in the reaction wheels. • VMU (Video Management Unit). The optical unit is in turn composed of the camera, objective, and baffle. The camera is based on a color camera with an interline transfer, progressive scan Kodak CCD sensor and it is able to acquire still color images and video sequences employing a Bayer (RGB) filter. 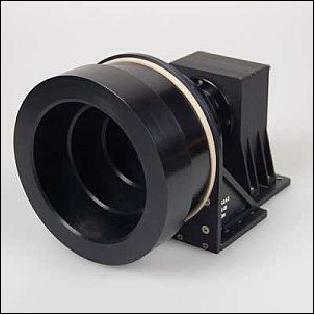 The optical unit is provided with a fixed objective with a focal length of about 30 mm and FOV of ±14.0o (for both the horizontal and vertical views). The HVS is based on a modular and highly configurable unit, referred to as H2VMU (High-resolution / High-frame rate Video Management Unit), and developed by Techno System Developments. The device provides state-of-the-art capabilities in terms of image acquisition, data compression and on-board storage for space applications. The H2VMU is fully configurable in terms of numbers of video inputs, video data rate and storage capacity. - real time transfer of compressed video data. • PCDM (Power Conditioning & Distribution Module) for unit powering. • OCC (Operations Control Center) located in the SSC Esrange satellite control center in Kiruna. The OCC provides the routine operations and surveillance and executes the TM/TC up/downloads according to MCC instructions. OCC utilizes existing antennas and infrastructure, but has been completed with a RAMSES installation. • MCC (Mission Control Center) located in Solna, Stockholm. The MCC contains the Mission manager and the engineering and analysis power. MCC prepares the operations, generates and validates (via a simulator environment) the flight procedures and analyses generic platform performance flight data. • ECC (Experiment Control Centers), one for each experimenter group. These can be located at SSC, but may also work remotely via internet. The ECCs prepare experiment scenario procedures (for MCC to validate) and analyses experiment data. • A data archive (not depicted on the figure). All flight data (raw as well as processed data) will be located on the internet accessible for all experimenters. SATSIM is the real-time simulator developed to handle and support the different phases of the PRISMA project. It is using MATLAB/Simulink model based design techniques and the RTW (Real-Time Workshop, a MATLAB code generation toolbox) to perform automated code generation. SATSIM is running on the MATLAB real-time operating system xpcTarget. There are many advantages to use the model based design, the simulator model is always up to date with the code generated from it. 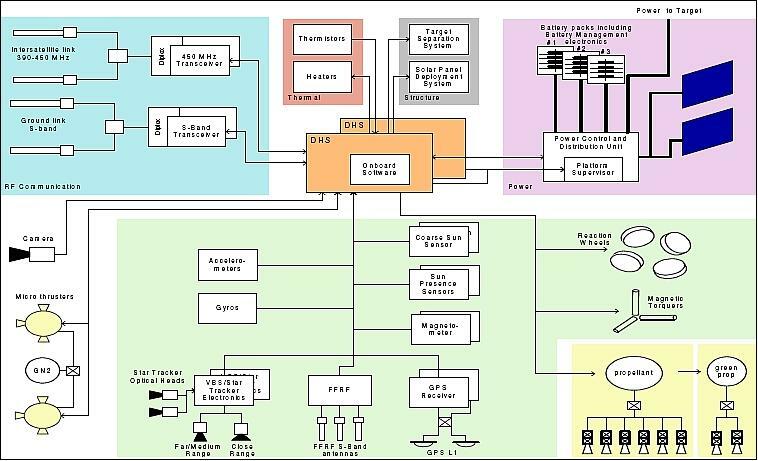 Also the simulator has been designed in such a way that the dynamics, sensor and actuator models are possible to connect with the GNC flight software directly and run it in a pure Simulink environment. This makes it possible for the GNC engineers to test algorithms without having to generate any software. The simulator model was also designed in such a way that sensors and actuator characteristics might be modified with tunable parameters. The sensors or actuators characteristics can hence be modified either from procedure scripts before actually starting the simulation, or by changing the behavior during the simulation (simulating different error conditions). All the tunable parameters are defined in MATLAB scripts. As part of the simulator release procedure, all these parameters are documented and summarized in a readable format with the help of MATLAB scripts. The documentation is therefore always updated and tagged to the specific simulator version. 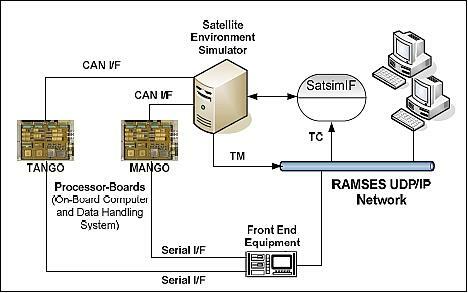 SATSIM-RAMSES communication: To be able to control the SATSIM from RAMSES an application is executing on one of the RAMSES machines, SatsimIF. 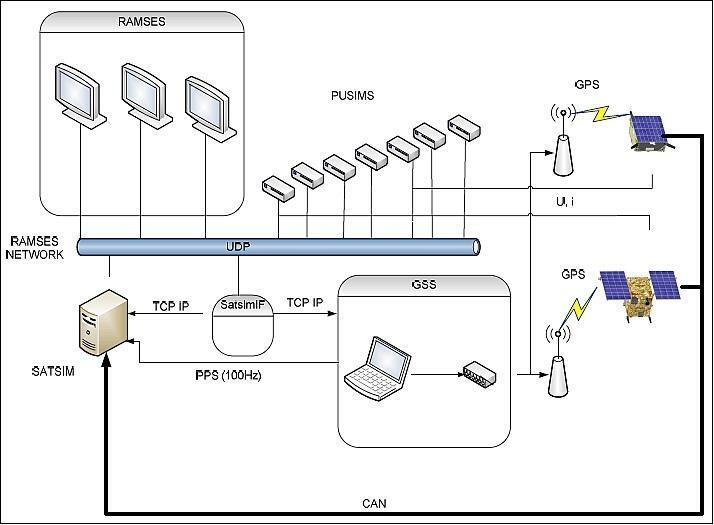 This application is responsible for establishing a TCP/IP connection with the Satsim computer. It is also responsible for uploading the simulated model on to the xpcTarget machine. After the connection is established the SatsimIF will listen on the RAMSES multicast UDP network and redirect all commands required to control the simulation in progress, i.e. start/stop simulation and changes of tunable parameters. SATSIM configurations: SATSIM was designed in such a way that it is possible to reuse the same functionality for different test purposes by only reconfiguring tunable parameters. 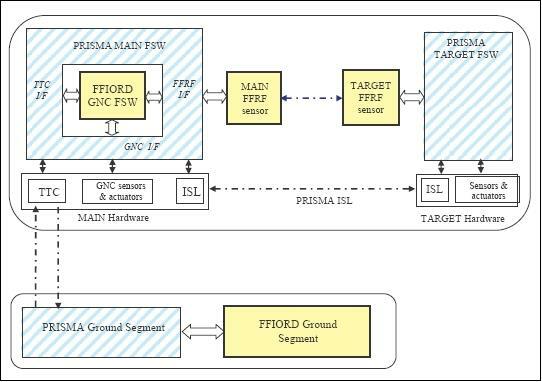 There are five different configurations of SATSIM used in the PRISMA project. 1) GAS, the most basic functionality of SATSIM. It is a pure software configuration. GNC connected to S/C models directly. 2) SATLAB (Satsim Lab a lab test bench that consists of SATSIM and OBCs) is used and configured for test with the S/W on the actual OBC. 3) AIT (Assembly Integration and Test) where none, some or all of the RTUs are included in the test loop. 4) GSS, where a GPS signal simulator is part of the test loop. 5) OPSIM, operational simulator that is used by the ground station operational team to run the experiments timeline in advance before it is uploaded to the S/C. GAS configuration: In this configuration the GNC software is connected to the core models of the simulator all implemented in pure MATLAB/Simulink. This configuration does not contain any external hardware and is used for test of the GNC S/W algorithms. This system is a faster than realtime system and it is used to speed up the simulations in order to give the GNC engineers a fast response on new simulations. This environment is also reused during the operation to validate the timeline of GNC operation. In this configuration the RAMSES product is not involved in neither commanding nor the TM archiving. The commands are setup in advance and the TM is saved in MATLAB directly. For the operational scenarios the command scripts are first translated into the command line as a MATLAB variable. When the simulation is started the commands will be executed (one at a time) according to the contents of the command variable. There is no possibility to send new, on-the-fly commands during the simulation in this configuration. Legend to Figure 42: In this configuration, the GNC S/W is connected with the simulator in the Simulink environment. This configuration is used both for a quick test of GNC algorithm development but also for validating the operational timeline. SATLAB configuration: The SATLAB configuration is a real-time system containing also the flight on-bard computers. In this configuration the RTUs are simulated and the SATSIM is connected with the OBC through the CAN bus. In the normal case in this configuration none of the RTU H/W are in the loop and they are completely simulated by SATSIM. The simulation input are the control commands received from the OBSW and the output is CAN data from the simulated RTUs, sensor-, actuator, power- and thermal models. Both the S/C and the simulator are commanded from the RAMSES software with the help of the PLUTO procedure scripts, thereby making it is possible to automate the tests. Since the timing of the tests is handled by the scripts the tests can be re-run hence making the timing of the tests deterministic. A big advantage of using the same control environment is that the flight procedures currently used by the operational team are the same procedures which have been used during the test and validation of the S/Cs. With this configuration the project has also the possibility to test and attend to timing issues of the space segment on ground before it is commanded to the real spacecrafts in orbit. 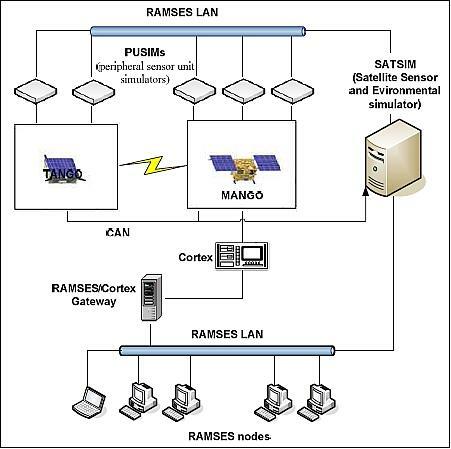 Legend to Figure 43: SATSIM is connected to the RAMSES environment via the RAMSES LAN. To enable communication with the SATSIM, an application SatsimIF is executing on one of the RAMSES computers which handle the control of the simulation. AIT configuration: In the AIT (Assembly Integration and Test) configuration, the SATSIM is no longer simulating the RTUs. The design of SATSIM facilitates the possibility to have a mix of real and simulated RTUs. This is very useful since HW availability during the tests might be limited. The SATSIM is physically connected to the S/C RTUs and sensor testports via the PUSIMs (Platform Unit Simulators). SATSIM is still connected to the CAN bus, but it is no longer generating any CAN traffic. It only listens to the on board control commands to update the dynamics. Based on the received command, SATSIM will then instruct the PUSIMs by sending them telecommands over the RAMSES network. In this configuration most of the S/C HW is part of the closed loop. Sensors which have a test port are also in the loop, such as rate-sensors, GPS, ST and VBS. SATSIM calculates the voltage, currents and serial data that the sensors generates and feed the RTUs with stimuli by sending commands to the generic PUSIMs. The PUSIMS are designed to receive commands send from the simulator (or RAMSES in open loop tests) over the RAMSES LAN and generates the currents, voltages which normally the sensors generate. In this configuration it is possible to run both of the S/Cs in closed loop and only keep sensors without test ports out from the loop. The AIT configuration test ensures the confidence in the system and gives the tester a great possibility to initiate a fast transition to the test they want to conduct and with the initial conditions they prefer. SATSIM control the S/C sensor(s) by sending commands to the PUSIMs. GSS configuration: Due to the importance of the GPS system for the PRISMA project it was decided to verify the whole GPS chain in closed loop simulations. In this configuration a GSS (GPS Signal Simulator) was added to the system to allow this advanced test to be performed. The GSS used is the GSS7700 Spirent. Due to the nature of the GPS signals, the oscillator in the SATSIM PC is not accurate enough to control the GSS signal output, the clock drift rate was as large as 0.7 seconds per hour corresponding to about 5 km in distance. This situation was not acceptable in a system with a claim of centimeter precision. 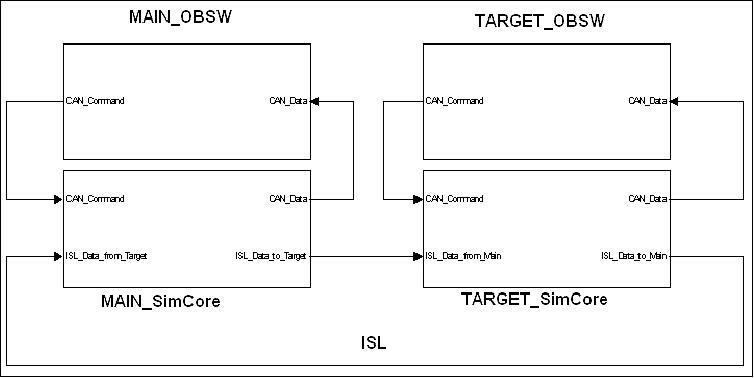 To allow for the GSS to be in closed loop, it is therefore necessary to change the xpcTarget interrupt source from using its own PC clock - to use the GSS very stable oscillator. However, this is not a very difficult task, requiring the selection of one of the parameters, when generating the code with the RTW parameter. By connecting the GSS 100PPS output to the parallel port interface and regenerating the code with the new xpcTarget/RTW parameter, it is possible to run the SATSIM with an external interrupt source. The SatsimIF is responsible for establishing the connection between SATSIM and GSS. SATSIM calculates the orbital and attitude information and sends it on to the RAMSES network in form of TCs. These commands are then redirected by SatsimIF towards the GSS that generates GPS signals which are transmitted and received by the S/C GPS antennas. The timing of the start of the SATSIM and the GSS has also to be synchronized. Since all simulation control commands are received by the SatsimIF software, there is no problem to handle the synchronization from this application. Legend to Figure 45: SATSIM controls the GSS by sending attitude and orbit commands to the GSS. 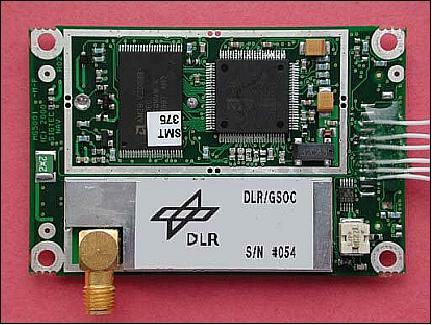 The GSS generates the GPS signals which are transmitted to the GPS antennas on the S/Cs. OPSIM configuration: With the OPSIM configuration, the SATSIM is configured for the operational validation. In this configuration only one RTU is in the loop and the other RTUs are simulated. This configuration also have an FFRF simulator which is an application running on a separate PC implementing the flight FFRF sensor software. This configuration is part of the operational configuration and can easily be switched to or from the actual ground control station using liveGate, a server application that enables tunnelling of data between separate LANs. This configuration is used to test the project experimental timeline before it is uploaded to the S/C. It was also heavily used for mission operation training and development of flight procedures before launch. • Space environment: perturbation forces, solar pressure, drag. For the RW model, the wheel speeds consist of the feedback data from the real S/C in the AIT configuration in order to achieve a representative simulation for unloading and S/C dynamics (to compensate for the actual RW friction). The sun-sensor model contains shading from S/C geometry. Startracker blinding by earth/moon and sun are part of the models. The power system contains both attitude dependency on solar panels and the dynamics of the batteries loading/unloading. The impulse from the separation of TANGO from MANGO is also a part of the models together with the changes in the inertial matrix. This makes it possible to simulate the separation sequence at the moment the S/Cs are separated from each other. For the Intersatellite Link (ISL), the noise and bit errors are modelled based on attitude and measured antenna gain pattern and the distance between the S/Cs. During the PRISMA test and operational phase, SATSIM together with RAMSES has been a stable and extremely important tool, not only to test the spacecraft segment, but also to train the operational team and to support the development of the flight procedures. Since the OBCs are part of the simulator, all commands and functions onboard can always be accessed, tested and tried out on the ground. The operational team can be confident in performing a task, because they can always choose to test the procedure in SATSIM prior to running the same procedure on the S/C. 37) Information provided by Thomas Karlsson of OHB-Sweden. 44) K. Anflo, B. Crowe, "Two Years of In-Space Demonstration and Qualification of an ADNBased Propulsion System on PRISMA," AAAF/ESA/CNES Space Propulsion Conference, Bordeaux, France, May 7-10, 2012. 45) Information provided by Simone D'Amico of DLR/GSOC, Oberpfaffenhofen, Germany.